In 1992 Phoenix Gold debuted its first limited production amplifier code named "Frank Amp'n Stein." Limited production run of approximately 300 units. 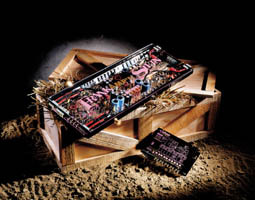 The Son of Frank Amp'n Stein is a limited edition "Truly Mutated" 4-3-2 channel amplifier. It boasts 2 x 75 watts RMS (our MS275) and 2 x 125 watts (MS2125), rated at 4 ohms. The amplifier ships in a unique wooden crate stuffed with fresh Oregon straw and wrapped in a custom silkscreened burlap body bag. To complete the system, a matching 3-way electronic crossover (FAS406A) is supplied. Both units are power coated with a jet black undercoat followed by a violet and blue glitter clear-coat for a unique, one-of-a-kind look. The FAS2400 includes a unique clear silkscreened plexiglass bottom panel. The silkscreen colors on the amplifier and plexiglass bottom are purple and gold. The Son of Frank Amp'n Stein is authenticated with a certificate of ownership. Two MS2250's built into one long heatsink without any fan shrouds. 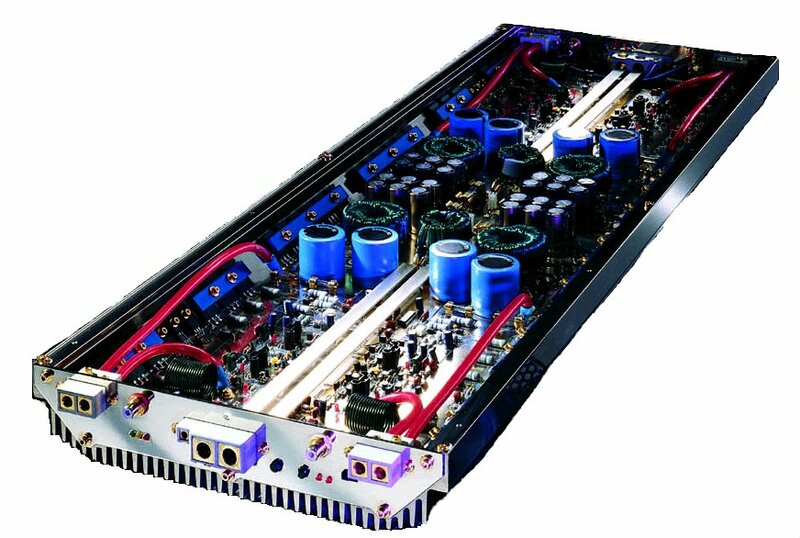 One of the largest and most powerful amplifier's ever built in the car audio industry. It has a custom nickel plated finished with a plexi-glass cover built in. Are the MS1000 or MS2250 stable at 2 ohms bridged/1 ohm stereo? No. The MS1000 and MS2250 are such powerful amplifiers that their heatsinks are unable to safely dissipate the heat these amps make at two ohms bridged. This excess heat and current within the amp causes stress on the internal components of the amplifier. Also, the current draw of either of these amps at two ohms bridged is too large for most car electrical systems to handle. This often leads to voltage drop on the B+ and B- terminals, which also puts excess stress on the internal components of the amplifier. Last modified: Monday March 20, 2000.